If counting sheep to fall asleep just won't cut it for you anymore, Alton has a solution. If you hop on over to Meri Acres Farm, you can help him count potatoes. Why would you want to count potatoes? Why not! And, if you just can't get enough, check out Extreme Potato Counter - same potatoes, twice as dangerous! I never said you could bury me in potatoes!! It costs nothing to play, so step right on up and get counting. 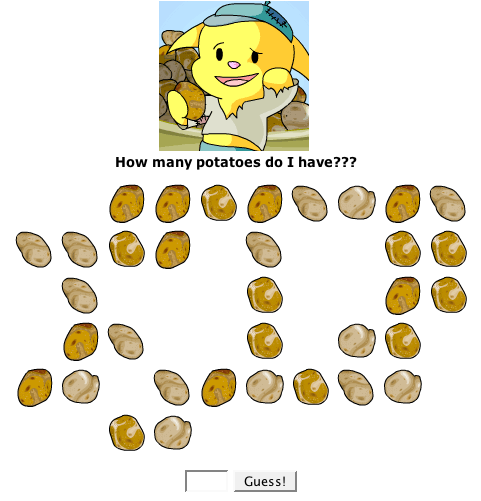 Alton will show you a randomly generated number of potatoes and, you guessed it, ask you how many there are. Yes, it's that simple! And, if you get more potatoes than you can (or want) to handle, you can refresh the page for another selection. In fact, people have reported receiving upwards of 2,000 potatoes! Once you think you've found the answer, simply type it into the box beneath the potatoes and click 'guess'. You can play this game up to 3 times per day.